OBT is an acronym for “Obtaining By Trickery”. For those not very familiar with the vocabulary of our police officers, when you are arrested and charged for OBT, it means that you are being accused of having used deception to receive money or property from someone or an organisation to achieve aims that are in variance with what you claimed while making the request or what the giver understood before letting go of the money or property. In simple terms, OBT is trickery and it has such synonyms as wayo, chancing, jobbing, 419 etc in our street lingo. In a city like Lagos, you naturally expect that there is a lot of OBT going on. Indeed living in Lagos seems to be a study in OBTing as millions of the residents go about hustling daily for a living. From the bus conductor who charges higher than the regular rate and who intentionally doesn’t give you back your change before you alight, the estate agent who takes money from multiple prospective tenants for a property he is not even in charge of, to even the pastor who digs into your bank account, promising a utopia that never comes, OBT is a common daily occurrence and one the Nigerian police (themselves, great culprits of OBT) have a field day dealing with. It becomes different when the government, the state government in this case, is culpable for OBT by creating an atmosphere that makes OBT by her agents an alternate revenue stream, under the guise of collecting supposedly legal charges, fees and taxes. That is exactly what has been happening in Lagos State. It is not news that since the return to democracy, Lagos State has continued to grow its IGR through a renewed focus on taxation. These funds, the government says, is necessary for the much desired infrastructural development necessary for making Lagos stand shoulder to shoulder with other top cities of the world as a mega city. The jury is still out as to how far or how well this funds are being utilised for the purpose the government claims, but one thing is certain, Lagosians and their businesses are groaning seriously under the weight of multi-taxation, tolls and ever increasing taxes. The latest is the Lagos merriment tax which hopefully shall be a topic for another day. My concern today however is how agents of the government have successfully made a trade of defrauding individuals and businesses, abusing the free hand they enjoy under the ‘taxation regime” and employing intimidation and force to legitimise their actions. This is becoming pretty sickening. The main preoccupation of Lagos State House lawmakers seems to be the creation of agencies and departments. There are today, a myriad handling all sorts of stuff; many simply a duplication of duties already being handled by an existing one. And all of them, including the multiple Local Development Councils, are tax collectors. Well, there is the LIRS that claims the statutory taxes, but all the others, starting from the most popular guys, LASTMA and the many other ‘LA’ acronymic bodies are basically tax collectors. To achieve their objectives, these agencies set up task forces or what some others refer to as “enforcement teams”, a body usually made up of staff of the agency, local touts and armed mobile police men. 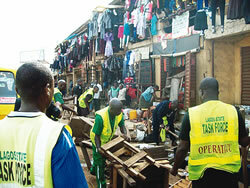 Wearing coloured aprons, these teams comb Lagos helping government claim what they say belongs to government. And because of the limitless powers they have accorded themselves, these gangs of obtainers go about constituting a nuisance with very little regards to the law. Indeed they are the law. They have become so ubiquitous that one does not now know when they are out on sanctioned assignments or when they are just carrying out OBT for their private pockets. It is not unusual for a task force team (without any authorisation from their mother agency) to storm a particular premises and begin to raise all sorts of issues – supposed laws that have been broken, for which payments have to be made or else, they will lock up and seal the place. These payments are often a negotiated settlement and usually not receipted. I encountered one such team recently who stormed a business premises in Victoria Island. The team was a KAI team led by one Mr Femi Ajayi who claimed to be Acting Area Commander (though he wouldn’t show an ID card), alongside about a dozen police men. The offence as alleged was that the owners of the premises had failed to cut the grass in front of their premises and the penalty charge for the offence was five hundred thousand naira (N500,000.00). Firstly, it was quite shocking that a Kick Against Indiscipline (KAI) official should be busying himself on a matter that concerns the environment which one will think should be the headache of Lagos State Environmental Protection Agency (LASEPA) or even the Lagos Waste Management Agency (LAWMA). Secondly, the amount of money claimed as penalty was outrageous. And he kept insisting that failing to pay, he would seal the premises and they would have to pay five million naira instead to unseal it. Quite a scene was created with the staff of the business going from questioning the authority of the team to finally negotiating. The wisdom in their compromise (which is what makes this style of OBT so easy for the perpetrators) is that should the premises be sealed, the business losses good money due to the disruption and the team would get back to Alausa (or wherever their office is quartered) and write a dubious claim, totally different from what had transpired leaving the business running around in a cycle. And because it is such a lawless society, the business (even when it has a good case of unlawful intrusion) will never get redress or compensation. After so much grandstanding, Mr Ajayi and his team pocketed fifty thousand naira and left with the cops in the weather-beaten danfo they came in. Off to the next maga. You might wish to imagine how much they would have made by the time they are done combing various parts of Victoria Island raising spurious claims and intimidating tax paying citizens (and businesses). Worse, even though the criminality is perpetuated under the canopy of government, not a dime gets to her coffers at the end. That is what happens when you create an atmosphere that allows for a free for all, where touts are the law, where all kinds of task forces have sweeping powers to seal premises without any court order. Many Lagos residents have their tales of same or similar occurrences. We make all sorts of illegal payments to supposed agents of government because the alternative is a long route that might never lead to justice. Only a few, the likes of Mr Jonathan Odutola, who took LASTMA to court has been able to go down that path and get justice. It’s now an increasingly difficult and unpopular task, encouraging citizens to stand for their right. The lawlessness and impunity is simply overwhelming. This message must be heard loud and clear in Alausa that the streets of mega cities around the world are not populated by thugs and miscreants working as part of their law enforcement agents, misbehaving in official capacity. That modern cities are not built by scorching businesses to death with all sorts of levies and taxes. That a government that indiscriminately creates task forces must equally be responsible for their actions and in actions. This government sanctioned OBT has gone on for long enough and we cannot survive their being unchecked. For one day soon, people may be forced to take laws into their hands in self-defence. Long before the Americans began the protest against social and economic inequalities, corporate greed, and corporate power, now known popularly as the Occupy Wall Street Movement, we had been occupying in Lagos. Yes, every day we occupy the roads in Lagos protesting for our right to free movement, fighting for our rights to earn the next meal, clutching desperately to dreams that are increasingly turning into illusions by the day. Every day we occupy the roads in search of a living, scratching and digging, our finger nails scrapping for whatever crumbs we can scrape out from the hard and gritty surfaces that represent our existence in this geographical entity we were born into. We occupy in frenzied rush to report to those places where we labour from 8am to 6pm. Places we really don’t like going to. Places we are forced to go just for the pleasure of the SMS bank alert at the end of the month. And when it is dusk, we repeat the occupation in the opposite direction. This time it is an exhausted rush to that place we hide our bones for the night. To the darkness and the endless chatter of fuel guzzling generators. To unpaid bills and threats from shylock landlords. To kids building their experiences from cable television and the internet as we are too busy occupying day and night to care. To that bed where more babies are made to join those who already do not have enough. We occupy, in cars bought with loans. Loans that have turned us prisoners of corporate greed in high places. To service the loans, we must feed the greed and continue the daily occupation in an endless cycle. We call it building a career. It requires us appearing in nice looking suits also bought with loans. It is never enough you know. We need to sustain the life that is expected of a career occupier. So we take other kinds of loans. Loans to buy home furniture. Loan to take a wife. Loans to go on vacations. To replay it all, we keep….. The Lagos State Traffic Management Authority (LASTMA) has a notoriety that predates my relocation to Lagos. My friends who lived in Lagos always had one thing or the other to say about LASTMA and the many other uniformed men that litter Lagos roads. There was also the federal government vs Lagos State issue, played out as FERMA vs LASTMA which was in the news some years back. It however took my moving to the city about a year ago to fully appreciate that the fear of LASTMA was wisdom itself on Lagos roads. 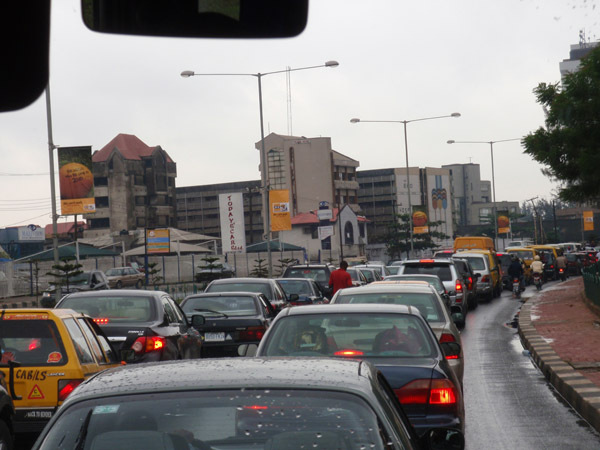 Extra ordinary situations demand extra ordinary measures they say and LASTMA was Lagos State Government’s answer to the traffic and the unruly behaviour of drivers on Lagos roads. Indeed it was also a solution to another problem, the area boy palaver. Speaking recently during the commissioning of a link bridge at the Ozumba Mbadiwe end of the Lekki Expressway, Governor Babatunde Fashola boasted that the traffic in Lagos had created close to five thousand jobs. These jobs unfortunately have been filled by people who many describe as touts and societal urchins; most of who are used as foot soldiers by politicians during elections. Put succinctly, in trying to solve one problem and create job for the boys, the state government created a whole new problem; one that certainly does it no good in its dreams of evolving into a respected mega city. A good number of the LASTMA officials, those on the road especially, do not even know what the law establishing their agency is and what the limits of their powers are. Seemingly enjoying a right to do as they like, the officials have over time constituted themselves into a law unto themselves. Many Lagos commuters have various tales of their often weird experiences with officials of LASTMA. They pounce on you like you are a criminal, their manner of approach leaving much to be desired. It often doesn’t matter what had made you stop on the road, their judgment defeats logic. Every car that stops on the road is immediate business. Even before you are able to make an explanation, a towing van emerges from nowhere and you are charged ridiculous amounts to get your car off the road. Besides all this, the agency does not have an official booking paper with specified fines for particular offences. What you pay is a function of your negotiation skills or the mood of the officers that had the good fortune of arresting you. If for any reason your vehicle finds its way into any of their offices, then get ready to grease many palms including that of the gateman who will let you out. The officers often time simply lay ambush for unlucky drivers and even in situations where a driver needs help, the officials main concern is the money to be made. Most of these fines are not receipted. Like most absurdities in Nigeria, many people bear it quietly. Our people are often only eager to get off the hook, pay or plead their way out of situations rather than challenge it. One citizen however would have none of that. Jonathan Odutola, whose car was impounded by LASTMA and an outrageous fine slammed on him, approached the Federal High Court in Lagos for redress. In a suit he started in March this year, he alleged that while driving his car on the Third Mainland Bridge, it suddenly developed some fault. To ensure he did not obstruct traffic, he got a towing van to move the car off the road. He also got a mechanic to help fix what was wrong with the car. Along the line, police men on patrol came to the scene and made the now usual demands for a bribe. His refusal saw him and his mechanic thoroughly beaten before being handed over to LASTMA officials who immediately towed the car to their office and consequently slammed him a fine if he must get his car back. Justice Okon Abang, in his landmark ruling, declared that LASTMA lacked the power to impose fines on traffic offenders after stating that sections 9,11,12 and 13 of the law establishing the agency were unconstitutional and of no effect. These sections, the judge said, were contrary to section 36 of the constitution which gives every citizen the right to fair hearing. 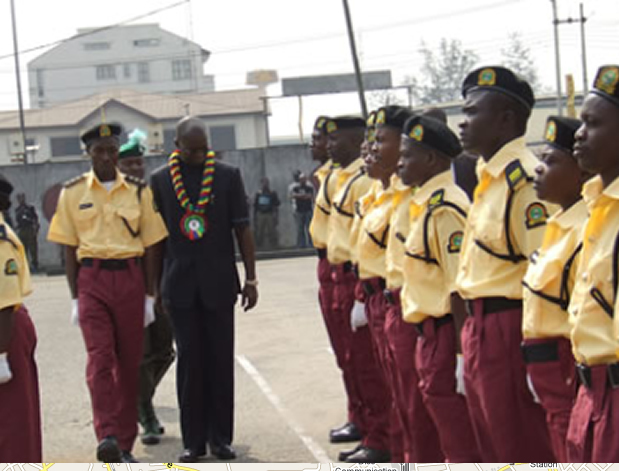 He consequently awarded N500,000 against LASTMA. In a swift reaction a day after the ruling, Fashola, who in himself is a legal luminary, said that the state had the residual authority to make legislation on municipal issues that fall within the ambit of the state. He further stated that the state would appeal the ruling. Whatever becomes of the appeal, one thing is clear; and this is that LASTMA doesn’t have all the powers it lays claims to. Furthermore, citizens must begin to challenge their being harassed by officials of the agency and use the judiciary more to their advantage in explaining the law and defining checking excesses of government agencies. While it is a fact that LASTMA sits as deterrent to many drivers, especially the commercial bus drivers who would rather convert every section of the road into a pickup or drop off point for passengers, its excesses has constituted it into a nuisance and one many Lagosians will rather is done away with. This is a democratic state not a lawless enclave. Citizens have rights that must be respected; and an agency funded by tax payers’ money to help them navigate the already challenging realities of life in Lagos can not constitute itself in the same breath into an additional challenge. LASTMA must reform and while they are at it, they might wish to seriously consider some lesson in courtesy. Read this piece and other articles from my Daily Times column HERE. Friday 17th June 2011 witnessed what could be termed the heaviest down pour yet of this year’s rainy season in Lagos. It probably signaled the first of many more to come based on the predictions by meteorologists at the beginning of the year. The rain which began just at dawn was heavy and windy in some parts preventing most Lagos residents from venturing out of their homes to work and their various businesses. Residents who braved it out stood at bus stops and road junctions for many hours under the down pour to board vehicles which were in scarce supply. The few bus drivers who were on the road used the opportunity to make quick profits, hiking transport fares as the demand far outweighed the supply. Because of the peculiar residential pattern that sees most Lagosians living on the Mainland and working on the Island where most of the businesses and corporate organizations have their offices, thousands of people were stranded in the Obalende and CMS areas of the city. 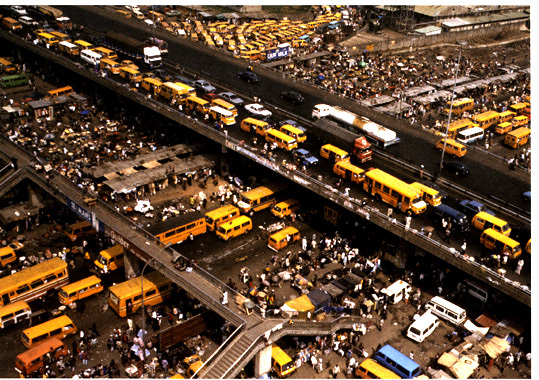 These are the popular bus terminus for Lagos Island bound commuters. Given the circumstances, the most sought after means of transportation were the commercial motor cycles (okada). However, like the buses they too were in limited supply and also astronomically increased their prices per ride. A ride from Obalende into Victoria Island which normally goes for N200 went for as much as N1000 with already drenched commuters falling over each other to hitch the available rides. The hike in okada fares was however not just because of the increase in demand. It was largely due to the most difficult terrain which the bikes had to ply through. Not only were the routes into Victoria Island and Ikoyi clogged with cars in a gridlock; most of the area was heavily flooded. Rain water in what has now become a perennial occurrence in Lagos had overwhelmed the often clogged drainages and had risen to fill up the streets and roads presenting a sight that was not only harrowing to the commuters but also a huge embarrassment to the city authorities who for long had been hawking the claim of building a mega 21st Century city. There was hardly any route that was not affected in the Business District. Ahmadu Bello Way, one of the major roads in Victoria Island was so flooded that only four wheel drive vehicles could brave it. Many cars got stuck, others were simply submerged. The waters were so high that there was no differentiation of where the roads or the gutters were so many unsuspecting drivers in their desperation drove their cars right into ditches. Commuters had to alight and wade through the pools which in some areas got to the waist level. All around was a tale of anguish, desolation and a clear indictment on the infrastructure managers of the city. Read full report in Daily Times Here. I still dey Lagos o. Yes, am not yet gone and I have not been consumed either. We are still in that getting-to-know you phase of relationships, that period when you get to find out he snores in his sleep or that she actually is useless in the kitchen and the fantasies of that memorable first date clears from your eye like dew on a sunny morning and reality stares you in the face with one ominous question “are you in or are you out?” Well, not exactly so in this case though as it doesn’t seem like I have the luxury of more than one option in answering that question. I am so in and the only option I’ve got is to find a staying power, something…anything that makes it an interesting stay. And so I find out that indeed the city in its own way strives to reiterate and enforce the fact that all men are equal or is it the rich also cry now? Well, you make your choice. Lagos levels us and places all men under a common denominator; traffic. Without so much effort, it crashes social stratification and leaves us all, both the rich and the poor, on a horizontal plain of absurd realities, all of us partaking in our own way in the daily dance to imaginary beats of Fela’s suffering and smiling. When we are in the traffic, which is like all of the time, there is no special lane for fine cars or for big men or for people who live in highbrow areas or for MD’s of blue chip companies. No exceptions. No privileges. Except perhaps you come with a siren and even at that, you have to literally move obstinate danfo buses out of the way with your hands and endure the rain of curses from both driver and passenger alike that will trail you. The sighs and hisses go round, emanating as much from air-conditioned oversized jeeps as they do from the yellow brigade of long serving weather beaten danfos. What’s more? both group of people get to make the same complaints at the end of the day, this time not just the poor complaining of food and water and access to good medication, in Lagos we all complain; traffic was so bad today. What could be more leveling?